Silhouette Connect™ gives you the ability to send projects you've designed in Adobe Illustrator® or CorelDRAW® straight to your Silhouette electronic cutting tool with no need to convert them to a Silhouette Studio® compatible format. Silhouette Connect™ allows you to design a project in either Adobe Illustrator® or CorelDRAW® and send it to your Silhouette. You’re able to add registration marks for print & cut projects and adjust the cut settings for different material types. You’re also able to cut by individual layer or line color, so you can easily alternate between different blade/pen settings. Double-Click the DMG to open it. Follow the on-screen instructions and enter the license key when prompted. The Silhouette Connect® plug-in allows users to send projects to the Silhouette electronic cutting tool directly from Adobe Illustrator® (CS4 – CS6, CC; does not support illegal copies of Illustrator) or CorelDRAW® (X4 - X6 - Full version only; does not support "Home and Student","Essentials" edition, or illegal copies of CorelDRAW). The plug-in does not currently work with any other vector imaging programs aside from those listed in the Compatibility section below. The Silhouette Connect® plug-in includes the ability to add registration marks for print & cut jobs, which work with the Silhouette machine's registration mark sensor. The Silhouette Connect® plug-in is offered at a cost of $39.99. The license allows the user to utilize the plug-in on up to three different computers. Once installed, the plug-in is accessed directly from the major vector imaging program in question. The plug-in requires Adobe Illustrator® or CorelDRAW® to be installed on the computer in question. 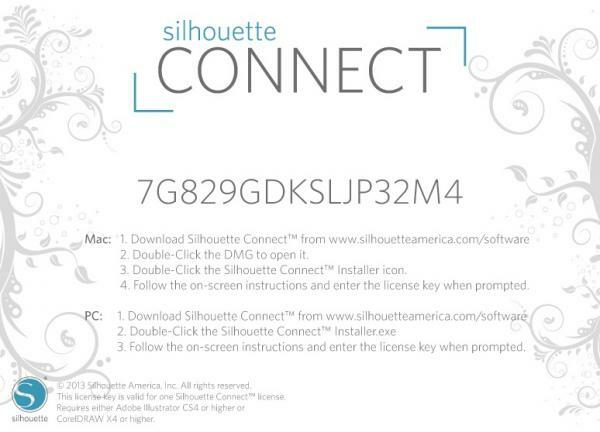 Purchase of the Silhouette Connect™ plug-in does not include the Adobe Illustrator® or CorelDRAW® software.